We marched from Shiraz on the 4th instant, and camped yesterday [5th August] near the famous Ruins of Persepolis – we are halted here today & I am sorry to say march tomorrow – I should like much to spend a few days more in exploring these deservedly celebrated Ruins. I will not attempt to give you any Idea of their Grand Appearance & will only say that I should think it worth any one’s while even to travel from Europe for the sake of visiting them. (S.R.O. Papers of Richard Charles Strachey, DD/SH\44\6: Richard Strachey to Sir Henry Strachey, ‘near the Ruins of Persepolis’ 5th-7th August 1800). The party, a British East India Company embassy led by Sir John Malcolm, ended up lingering until the 7th, and Strachey accordingly took the opportunity to carve his name on a couple of monuments. He also carried off a fragment he said he had dug up near the north façade of the monumental columned hall now known as the apadana. On this façade, lines of representatives of the peoples subject to the Persian king originally converged on a central audience scene with the enthroned monarch, just as Strachey and his colleagues were voyaging towards the Persian court at Tehran. Richard’s father Sir Henry described this same fragment to the Society of Antiquaries a couple of years later, using a carefully edited amalgam of more than one of his son’s letters from Iran and India. The Strachey head was the earliest Persepolitan fragment to arrive in Britain that I have so far traced, and its evocative publication was influential; in the next thirty years, during a cluster of diplomatic journeys overland from Bushehr, those British visitors who could afford the transport costs sent a series of stone sculptures back across the Zagros mountains to the Persian Gulf. They were shipped back to the UK on Royal Navy or East India Company vessels. Over the course of the next century, the majority of these wound up in the British Museum, with a handful in other UK collections. 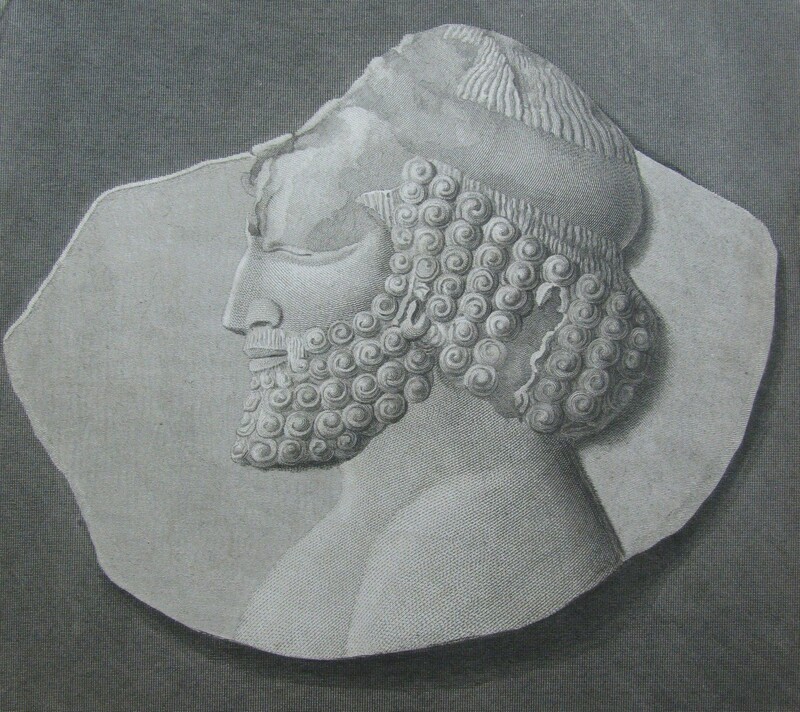 This piece, below, was taken during Sir John Malcolm’s second visit to Persepolis, in 1810, and sent back to his family home in Dumfriesshire where it stayed until 1950, when it was sold to the Royal Scottish Museum in Edinburgh. Fragment from the east wing of the north facade of the apadana at Persepolis, National Museum of Scotland 1950.138 (picture copyright National Museums Scotland). I wrote up a history of these fragments in a 2013 article in the journal IRAN, arguing that they functioned as part of societal gift exchange within the East India Company and diplomatic hierarchy. This traffic of luxury goods has been illuminated recently by a series of studies published by the East India Company at Home team at UCL, whose input also enhanced and influenced my research. At the time of writing, I did not know the current whereabouts of the Strachey head. It had stayed in the Strachey family through the nineteenth century, being loaned out twice for London exhibitions of ‘Persian art’; this 1885 image of an exhibit at the Burlington Fine Arts Club shows the fragment in a frame displayed alongside Islamic metalware. Illustration from Wallis, H. 1885 Catalogue of Specimens Illustrative of Persian and Arab Art Exhibited in the Burlington Fine Arts Club London, photograph courtesy of Moya Carey. …intended to have sent you with the head some other reliques [sic] of Antiquity, from the ruins of Babylon, but they are gone, by mistake, amongst some other things to Midnapoor … [where he would ask his older to brother to send them on]. (S.R.O. Papers of Richard Charles Strachey, DD/SH\44\6: Richard Strachey to Sir Henry Strachey, from ‘On the river’ 11th July 1801). After being exhibited again in 1931, the fragment, now removed from the frame, surfaced in a Paris auction in 1986; thereafter it passed through the hands of several dealers. Thanks to a couple of curator colleagues, more information has now emerged. The head has undergone restoration since his arrival in the United States, his face and gaze made complete, but it is recognisably the Strachey fragment. I got in touch with the museum and requested some extra photographs which they kindly supplied. Although the piece arrived at the museum in 2000 with none of the provenance I had reconstructed, one fragment of its biography had stuck to it through its transatlantic transfer: a paper label naming its hometown pasted over the crown of the figure’s head. The fragment is not currently on display, although the museum does have another piece of ancient Near Eastern relief sculpture, an Assyrian winged figure from Nimrud (fragments from the neo-Assyrian cities are often modern gallery-companions to Persepolis – older and younger representatives of Near Eastern civilisation). The donors of our Persepolitan guard were Ruth and Bruce Dayton; so this onetime subject of the Achaemenid king is linked by its ownership history to a New World empire, the Dayton’s and Target retail chains. According to Lord Curzon, who visited the same building in 1889, this “‘Beau Brummel’ of Persia, Istarji… was framed between the mythic heroes Zal and Afrasiab – an apotheosis which I am not aware that any other Englishman has every attained.” (Curzon, G.N. 1892 Persia and the Persian Question vol. 1 p.340). In all this busy traffic of symbols, treasures and (self-)representation, Strachey was playing the “ever affectionate and dutiful son” to his parents while being received as a timeless model of exotic beauty in the Qajar court. The face of ancient Persia that manifested Strachey’s status in London represented age, “an old man’s head” (notably the adjective, in print, was Sir Henry’s addition to Richard’s manuscript description), while in Iran itself, Strachey became an equally fetishised incarnation of Western youth. Persepolis – Calcutta – London – Somerset – London – Paris – [New York?] – Minneapolis. Allen, L. 2013 ‘”Come then ye classic Thieves of each degree”: the social context of the Persepolis diaspora in the early nineteenth century’, in IRAN vol. LI, 207-34. Langer, A. 2013 ‘European Influence on Seventeenth-Century Persian Painting: Of Handsome Europeans, Naked Ladies, and Parisian Timepieces’, in Langer (ed.) The Fascination of Persia: the Persian-European Dialogue in Seventeenth-Century Art and Contemporary Art of Tehran, Chicago, pp. 170-237.